With the warmer weather setting in and Memorial Day this weekend, it seemed like a perfect time to remind both visitors and locals of the places in Hendricks County, Indiana, where you can cool off, have some amazing family fun and make some memories. So, starting digging out those bathing suits, find some sunscreen and don&apos;t forget your camera as you put these places on your must-visit summer list. 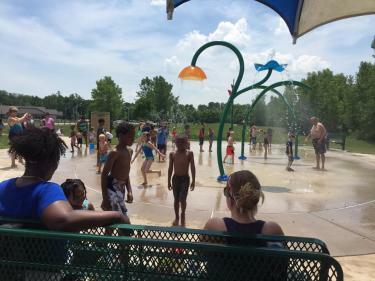 Located in the back of Williams Park, the Watermill Splash Pad, which is part of Brownsburg Parks and Recreation, features amenities for all ages. Along the outside are small features for any water-loving tot. As you head to the inside of the circle, the amenities get bigger and wetter. The most unique water contraption, the Superwave, brings in the bravest of kids to get doused in a 32-gallon downpour. Insider Tip: This park has great space surrounding it to lay out a blanket and watch the kids have a blast. Hours: Everyday 10 a.m.-7 p.m. If you are looking for the best water experience you can find in Hendricks County, look no further than Splash Island in Plainfield. This Caribbean-themed water playland boasts a zero-depth entry area and small playground with slide for the little kids while the teens can enjoy the basketball pool and balancing amenities, because even when you fall it is fun! 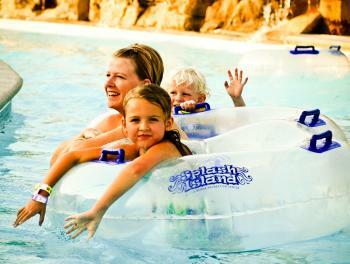 Every age loves the leisure river, and this water park also has the classic big slides and diving board area. But don&apos;t short change this water playground by trying to make your visit a quick trip, allow for many hours of fun! Insider tip: You can bring your own cooler with food and drink. See the guidelines here. Opening day: Today, May 25, 2018, 10 a.m.-6 p.m. Hours: Open every day through July 31 Monday through Saturday 10 a.m.-6 p.m. and Sunday noon-6 p.m. Wet Wednesday Nights 7-10 p.m. with discounted rate and entertainment. Beginning in August, open only on Saturdays and Sundays through Labor Day Weekend. Another great waterpark option that isn&apos;t as busy as Splash Island can be found in Danville&apos;s Ellis Park. 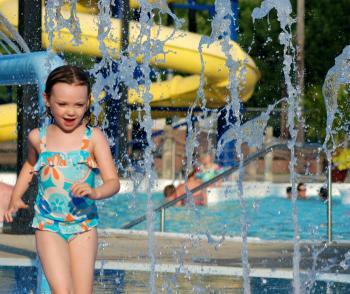 The Gill Family Aquatic Center has many of the amenities that Splash Island has on a smaller scale. It boasts a zero-depth area, two water slides, splash pad, lazy river and diving board. If you are looking for a pool with various amenities at a great price, check this one out! Insider Tip: Looking to host a group? You can rent out this aquatic center for just your use! Opening day: Saturday May 26, 11 a.m.-7 p.m. Hours: Monday through Saturday 11 a.m.-7 p.m. and Sundays noon-7 p.m. through Aug. 7. When The Shops at Perry Crossing in Plainfield remodeled in 2016 they turned the playground into a pop-jet fountain for kids to play and cool off. Insider tip: BRU Burger Bar recently joined the mall&apos;s dining lineup, and a few other new stores recently opened. Hours: Everyday 11 a.m.-5 p.m. When you get to Washington Township Park in Avon, head down the hill to the reach the splash pad. We love the nice playground right next to it. Many kids like to go back and forth, and parents like that they don&apos;t have to watch the weather that closely to determine if they should go. If it is slightly cooler, they can just play on the playground. Typically during the summer, they get chilled a little in the water, then warm up on the playground, then cool off on the splash pad. Insider tip: Hours are open the latest during the week and earliest on the weekend! Hours: The 2018 season runs Memorial Day weekend through Labor Day weekend, and the splash pad is open Monday- Friday; noon-8 p.m., Saturday & Sunday 10:30 a.m.-6:30 p.m. Although this splash pad is the smallest of our local ones, the fact that it is inside Hummel Park makes it a wonderful way to spend your time. Enjoy the shaded trails, two playgrounds, toss rocks in the creek and then cool off at the splash pad afterward. 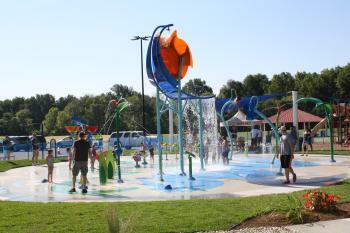 Insider tip: The maximum capacity of this splash pad is only 45 people. If you can, go early. Hours: May- August, Everyday 10 a.m.-7 p.m.